In recent posts I have introduced the Soviet cult of Lenin within the context of the Communist Party’s violent assault on Christians. The Communists could not avoid violence in general because it was built into the ideology they inherited from Karl Marx. I will speak elsewhere about Marx’s place in the history of Christendom, but here I want to emphasize the role of violence in Marxism’s vision of history. History could not move forward without it. And history had to move forward. In the nineteenth-century “age of progress,” absolute standards of good and evil, cultivated by centuries of Christianity’s influence, were exchanged for a relativistic morality of progress. That which brought it about was good, and that which hindered it was evil. This is why Trotsky’s “dustbin of history” speech on the occasion of the Communists’ seizure of power in 1917 was so significant. It revealed the new morality that would attend the new society and even new humanity Communist ideology sought to create. That new morality was nothing if not violent. Lenin had a saying (in Russian): Kto kovo? It can be translated very liberally as “who will destroy whom?” It defined his approach to politics. All of Communism’s opponents were by definition “class enemies.” They must be destroyed, they must be cast into the dustbin of history in order to create a truly progressive utopia. It didn’t really matter what class one came from, though certainly the old nobility and nascent middle class were at the top of the list. (It is a profound irony that not only Marx himself but also Lenin were best described by the categories of Marxism as members of the middle class). 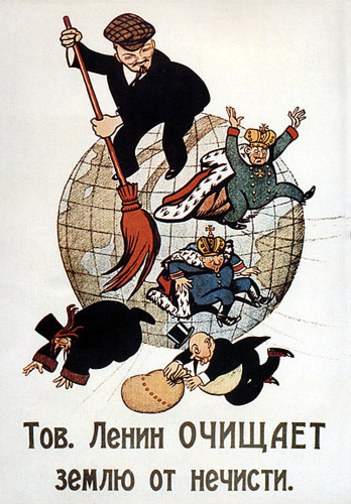 Soviet propaganda poster depicting Lenin eliminating class enemies including, at bottom-left, an Orthodox priest. And I have noted in past posts how members of the clergy–regardless of class origin–were lumped together with the so-called bourgeoisie. Even industrial workers themselves, if they did not align themselves with the Communists, could be and in actual practice were labeled as class enemies. 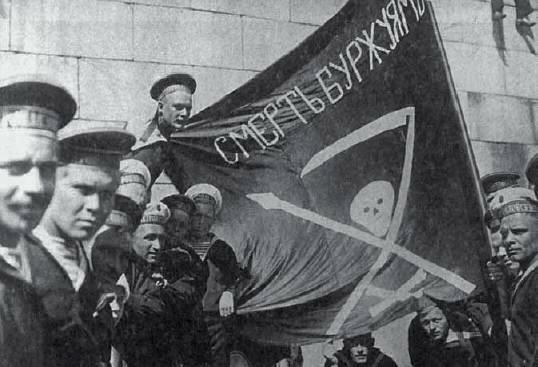 In the notorious case of the Kronstadt Rebellion of 1921, for instance, when workers rose up against the newly formed totalitarian dictatorship, Lenin and other members of the party regarded these proletarian adversaries as in effect agents of capitalism. Kto-kovo, “who will destroy whom?” The saying characterized well Lenin’s approach to revolution, political or cultural. And since he created Communism and continued to influence it from beyond the grave through the Lenin cult, the violence implicit in the saying continued long after his death. The initial years of Communist rule had been brutal enough. They had brought the Russian Civil War (the deadliest in European history), the creation of the secret police (the progenitor of the KGB), and the institution of what Communists unabashedly called a “Red Terror.” But after Lenin died in 1924, things got worse. That brings me to Joseph Stalin. I’ll begin talking about his place in the history of Soviet Russia’s cultural revolution next time. ← The Fool Says . . .